4 East is 12.9 miles long (one way), with 2814 feet of climbing. It starts near Los Alamos, about 5.4 miles south of White Rock. We rode it as described by Summerson, but an alternative would be to start at the Bandalier Shuttle Parking in White Rock, which would add about 11 rolling miles to the ride. 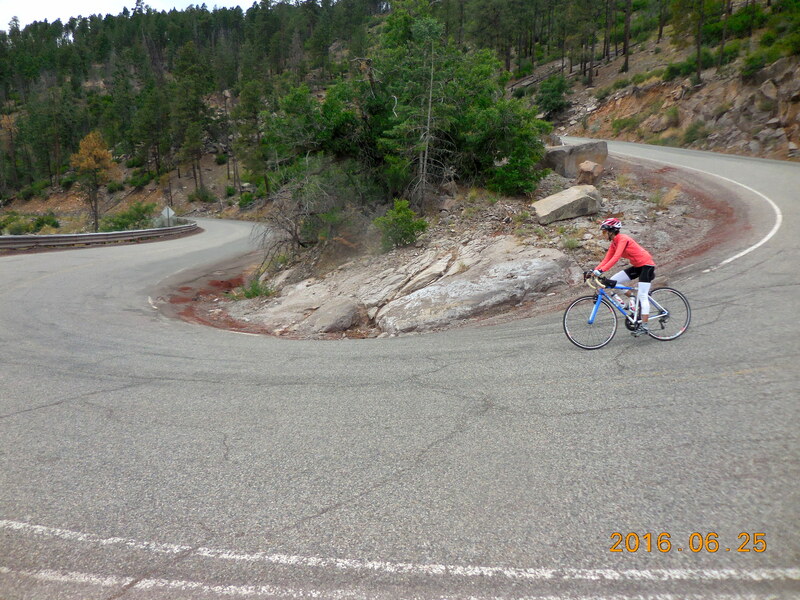 After the initial two switchbacks the ride flattens out so much that I wondered why it was even in Summerson’s book. Eventually, after a lot of nothing-to-write-home-about riding, you reach the intersection with Highway 501. This is where the climb gets good, with plenty of 8 and 9%. From the intersection it’s about 4.4 miles to the top, with 1,370 feet of climbing, the best part being immediately after the intersection. The top itself is an unmarked summit 0.8 miles after MM 46. The only sign is one showing that there is a downhill after this. You can add to the fun by taking a detour into Bandalier National Monument on the way down. From the entrance booth to the Visitor Center it’s a round trip of 6.3 miles with 630 feet of climbing. The final descent to, and ascent from the Visitor Center are fantastic. The climb to the Santa Fe Ski area is 15 miles, with 3,402 feet of climbing, ending at an elevation of 10,350 feet. It’s a good climb, with some steep sections, some gentle sections, lots of twisty sections, and three downhill sections (at miles 3.6, 11.3, and 14.1). As you ride back down you will climb an additional 370 feet, giving a total of 3772 feet. Start at the Fort Marcy Recreation Complex at the intersection of Bishops Lodge Road and Artist Road. (Bishops Lodge Road is the continuation of Washington Avenue if you start downtown.) You can park at the Recreation Complex for up to 3 hours. Climb steeply up Artist Road until the gradient eases after about 0.5 miles. Just after the 10,000 Waves spa, at mile 3.6, there’s a lovely descent for 0.7 miles. You reach the Hyde Park Visitor Center at about 7.4 miles and the road steepens for the next 1.4 miles. After the gradient eases again, follow the road as it twists and turns until a short descent leads into the ski area. Follow the ski area road either way to its high point. A wonderful ride with lots of climbing through beautiful country. The official route starts about 18 miles north of Santa Fe, just north of Pojoaque, and finishes in Ranchos de Taos, at the south end of Taos. The ride is 55.2 miles long, with 5,500 feet of climbing and 4,317 feet of descent. 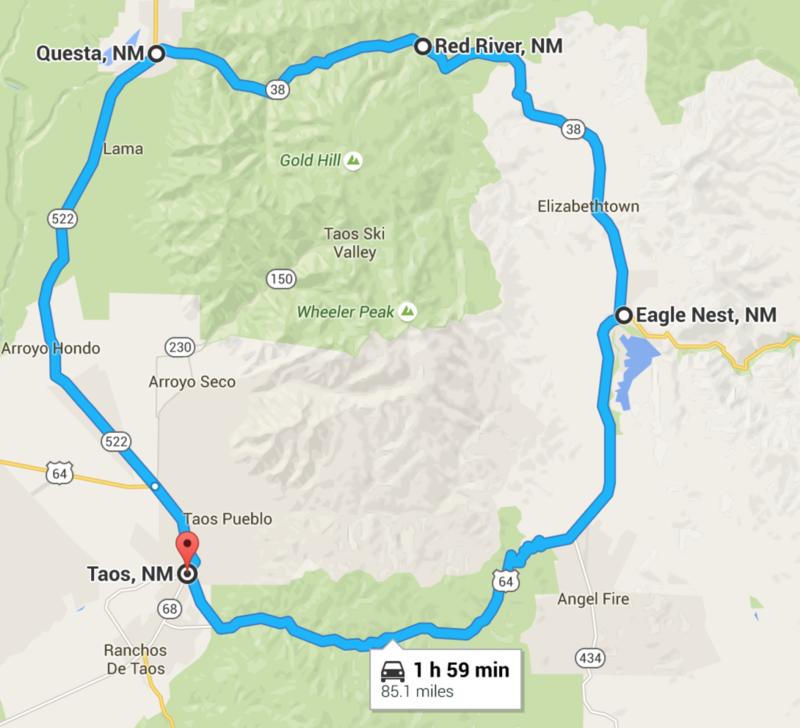 You can start in Santa Fe if you prefer, and you can finish anywhere in Taos. Both of these will add miles to the trip. The vertical lines in the profile indicate the junction described below. Start at the intersection of Highways 285 and 503, just north of Pojoaque, and head east on 503. The first part of the ride is gently rolling, and slightly uphill. At 11 miles, at the T-junction with Hwy 76 turn right on 76 towards Truchas and Peñasco. At 32.5 miles, at the T-junction with Hwy 75, near Peñasco, turn right on 75. The section along 75 is the least interesting part of the ride. In Peñasco, follow 75 as it takes a sharp left. 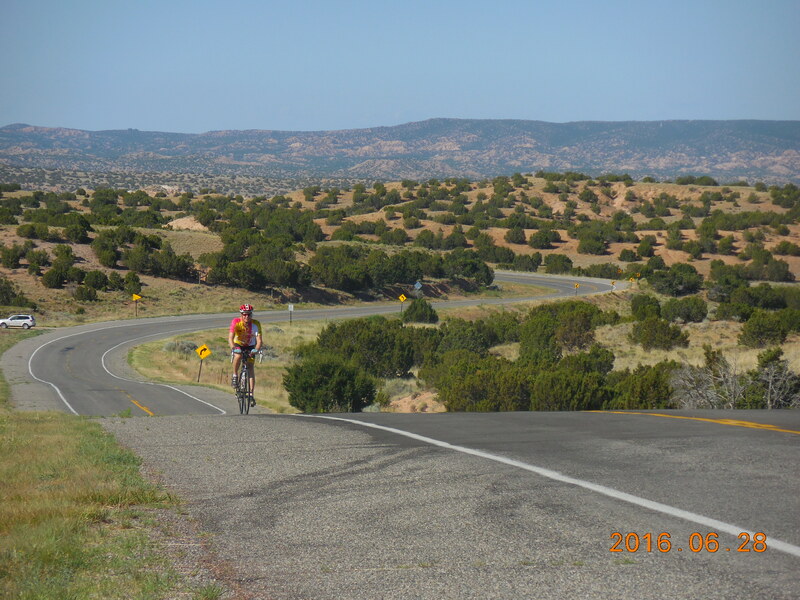 At 39.4 miles, about 5 miles past Peñasco, at the T-junction with Hwy 518, turn left on 518 towards Taos. After a good initial climb you have an enormous downhill into Taos. At 55.2 miles, finish in Ranchos de Taos at the intersection with Hwy 68. Here’s a page about the High Road to Taos, describing all the villages you will see on the way. 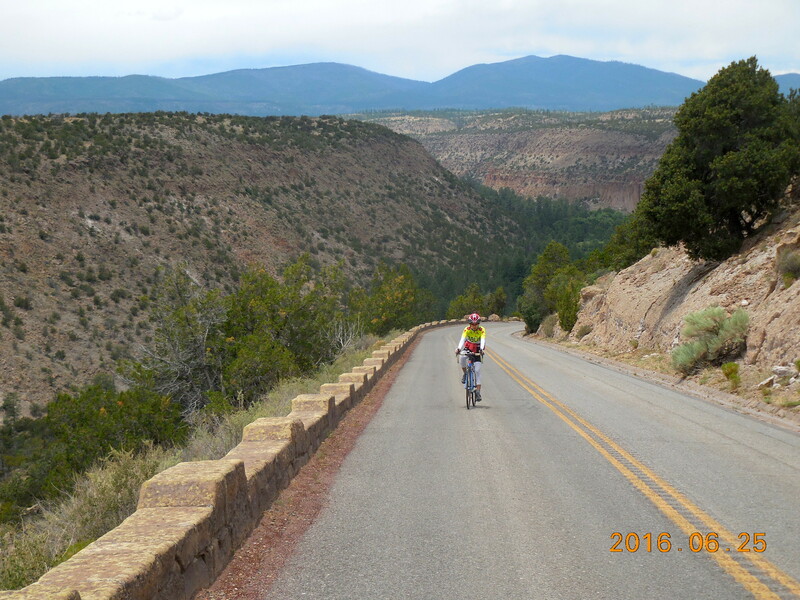 The Enchanted Circle is the classic Taos ride – 85 miles of varied cycling through beautiful country, with 5,300 feet of climbing. It circles the Taos Mountains, which contain New Mexico’s highest peak, Wheeler Peak at 13,161 feet. You can ride the Circle in either direction, but clockwise is the best. This way you ride the rolling section between Taos and Questa while your legs are fresh, and you end with a long downhill (18 miles and 2,133 feet of descent) into Taos. If you ride counter clockwise you are faced with the long, gradual ascent out of Taos on a road with no shoulder, into the sun, and with quite a bit of work traffic (trucks and pickup trucks) – at least that was my experience. From the center of Taos, ride north on Highway 64 for 4.1 miles to the traffic lights where 64 turns left and 522 continues straight. This section of road can be quite busy and the shoulder can be dirty. Follow Hwy 522 north for 20 miles to Questa. After about 5 miles the serious rollers start. 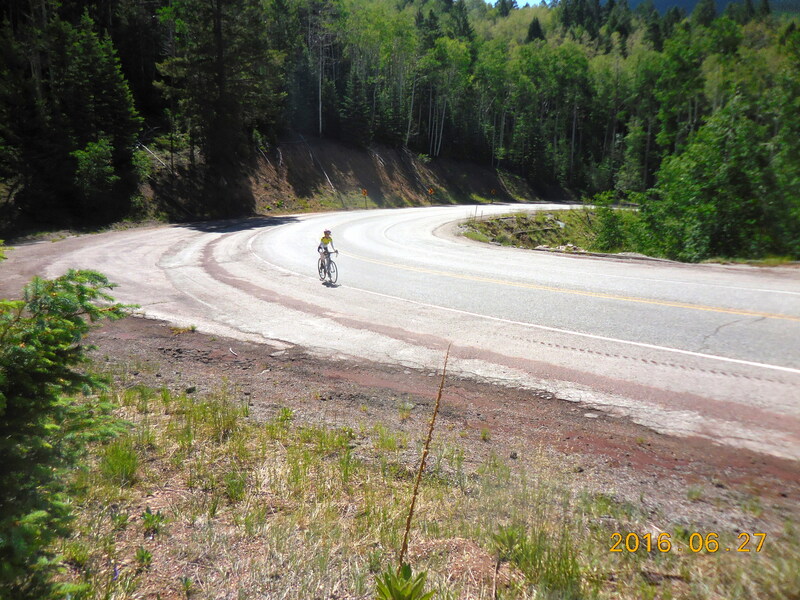 Turn right at Questa and follow Hwy 38 for 29 miles and 2,380 feet of climbing, through the pretty tourist town of Red River, to Eagle Nest. At the end of Red River, 38 turns left and immediately starts the big climb (4 miles, 1,158 feet of climbing) to Bobcat Pass. When you reach Eagle Nest, you can get lunch at Cowboy’s Cafe on the right. Otherwise, turn right on Hwy 64 towards Angel Fire. This 9.5 mile section is through a wide, open, flattish valley. At the intersection with the road into Angel Fire (Hwy 434), continue on Hwy 64 for 3.3 miles and 735 feet of climbing up the twisty road to Palo Flechado Pass. From here, an 18 mile descent takes you back into Taos.